I don’t have a lot of words this week. Tomorrow we will be remembering the life of a wonderful man. Photos have been smiled at, stories shared and tomorrow we will say goodbye amongst our friends and the many others who loved our friend. I am just sharing the words to a song that comforts me. I share only the lyrics because the words are what matter. I pray all of you have a blessed week. This time of year is always bittersweet. Although I love fall, the impending end of our time at the cabin is always a sad one. We arrived home this weekend from our last trip to the cabin. We had the most wonderful week as a family. Spent time playing games, watching movies and the boys had way too much fun exploring outside. The trees were beautiful, dressed in their fall colors of orange, yellow and red. The lake was calm and the air chilly. The wood stove kept us warm as we snuggled under covers and read storybooks. What a wonderful escape, so thankful to have that cozy place to visit. And even more thankful for an uninterrupted week with my little family. It is so hard to believe that this was Gray’s third summer out at the cabin and that next year when we return he will already be three and a half. Time is just slipping through our fingers!! 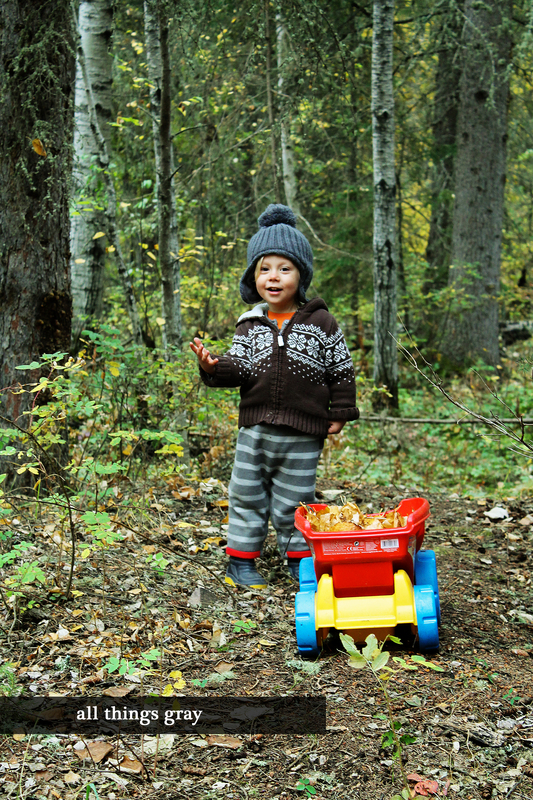 Gray loved hauling leaves and branches around with his Daddy, getting the yard ready for winter! Finding ladybugs became a fun game. Gray finally let them crawl on his small hands, giggling as they went. Little Boy loves his Dad!! #204 – Art supplies, these are really fun! #207 – my Moms homemade French fries! #209 – “Praves” (aka prayers) with my adorable son, they always have to include his dump truck, backhoe and many other miscellaneous toys! #213 – 1, 2, 3 GO!!!! 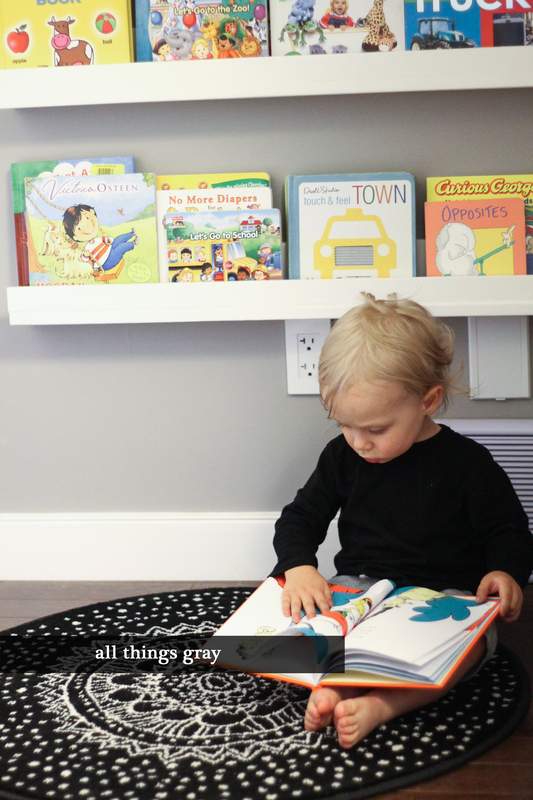 I really wanted to do a little book nook for Gray, but we don’t have any cute extra closets hiding anywhere around this house! We don’t even have a linen closet! The shelves are from a plan called Ten Dollar Ledges. Reason being, it costs about ten bucks for an eight foot section of shelving. Which means my three little shelves only cost about ten bucks! We made three six footers of these for our lower living room to house a whole lot of picture frames. I built the book nook ones slightly different than Ana’s plan, only because these are in a small hallway and I did not want them to stick out quite as far. So if you look at the plan you will notice that a 1X4 and a 1X2 sandwich in an additional 1X4. What I did was put the 1X2 and the 1X4 on top of the 1X4. I secured it underneath. This meant a lot more finishing for the front, but it gave me the result that I wanted. This is a fairly awkward space to take a picture of because it is just a tiny hallway right outside Gray’s room. This is what I started with. I marked my studs and put these babies up. Piled them full of books and brought Gray upstairs to see, I think he approves! I also hung an ABC poster up. I hung it at his level so that we can look at all the pictures and letters together. I couldn’t find something store bought that I liked so I downloaded this really cute digital kit from Zoe Pearn. I bought this one, which is considered the boy one. I personally think it is more gender neutral. There is also this girl one, and this flashcard one. All pretty cute! I used Photoshop Elements to design my own poster. I sent it to staples and a couple days later I picked it up. I put it in a frame we already had and now had some art that Gray and I can learn with. With the poster, the rug and the shelves this project came in under $30. Not bad for some storage and a cute spot to read. 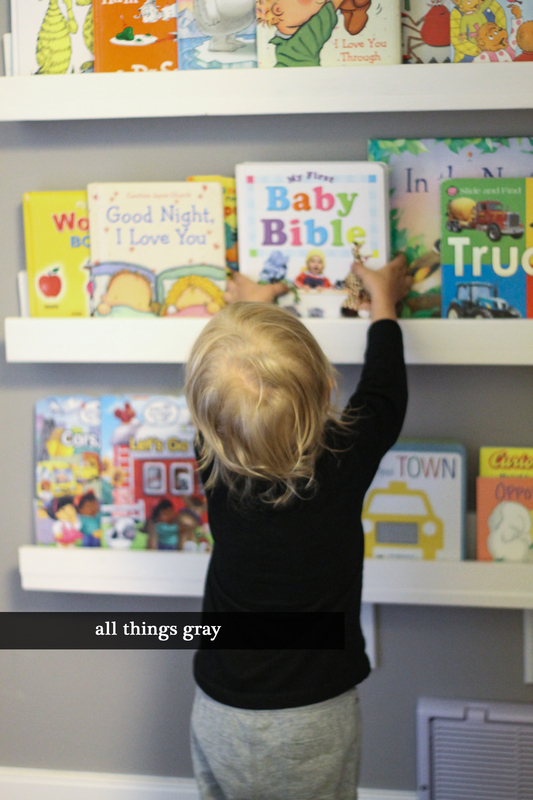 I find Gray reaching for his books way more now that he can see all the fronts. Do you have a spot in your house where you enjoy to read? Every night when I lie down in my bed I ponder the day. Sometimes I beat myself up for something I did or did not do. Maybe I raised my voice or wasn’t as active with Gray as I should of been. Maybe our day was full of temper tantrums (both of us!) or maybe it was quiet and connected. No matter what happens, every night I go through it. I think that always leads to wondering if I am doing a good enough for my young man. Am I spoiling him? Do I hold him back? Does he have fun during the day? Did he eat healthy enough? Most Mamas do. We question and research and look at our jobs as Moms. Mama guilt creeps in from time to time. Exhaustion is often knocking on our door. I was also finding this year, that longing to expand our family or to get the house completed, etc. took away from my time with my son. That precious time that is just slipping through my fingers, whether I like or not (I don’t, by the way – slow down!!). Me, thinking or wondering what path we were headed down, where we were going, worrying about what was or wasn’t going to happen. Time just wasted on things that don’t improve by worrying. So, I started to trying to figure out what my boy needed. I already knew these, but simplifying and breaking it down ensured me that I could get it all done and that I could grow and improve in the process. His needs are not many, food, water, cuddles and as much love and affection that we could dish out. So what was I missing? I realized that what I was missing was the fact that the love I was giving was often interrupted. The phone would ring, the house would need vacuuming. my mind would wander as we were conducting a very important car race around the living room. I was physically there, but sometimes I was mentally missing. Zoning out my precious boy who looks up at me with his big brown eyes asking me to, “come see, come see! !” And I think that I finally connected it all, Gray wants us, just as we are. He wants loving parents not longing parents. He doesn’t need parents who are sitting with him and thinking of something else. Parents who can’t log off their email or put down their phone. He doesn’t need parents who get swept away in worrying instead of playing hide and go seek. He needs us, regardless of what we need to do an hour from now or what condition the house is. When he remembers his childhood I don’t think he will be focused on how many dishes were in the sink. I want him to remember that we made time for him. Time to listen to his stories and to practice counting or colors. Us, focusing on him, praising him, hugging him and playing with him. Loving him fully every single day. This boy we have been given is a gift. And I try my best everyday to make sure I am not taking this precious soul for granted. That I am giving him all that God expected when He entrusted Gray into our hands. Everyday takes some shifting, some adjusting. Some days don’t always go as planned. Our life isn’t perfect, I am not a perfect Mom. But, I am a Mom who tries her very best for her son, who tries to give him all I have. In the evening when I ponder, I pray that the Lord would direct me, that I would know how to raise Gray. That He would show me what Gray needs in his life. If our day was messy and disappointing I pray that tomorrow I would do better, give more, love honestly. Remember each day is a new day, don’t be hard on yourself for yesterday, start anew today. Do you ever just feel completely overwhelmed? When you have to just throw up your hands and announce that your done? Well, I have been feeling that lately. Sort of the burdens of the world on my shoulders in a way. Although, I am the one who placed them there…or did I? God does work in mysterious ways. I had a bit of a blog break. Not intentionally, it just turned out that way. One day streamed into the next and before I knew it I hadn’t written in a few weeks. Wow! Where does the time go? I had a hard time wanting to write after posting about sweet Hope. I kind of didn’t want there to be a post after Hope. You know? I just loved logging on and her beautiful face popping up into the middle of my screen. Taking a moment to pray each time I walked by the computer, for Amy, for Shawn, for Sadie, for Charlotte. Sort of breathing in the moment and simply accepting the peace the Lord can bring. I didn’t want to move on, not wanting to move past that beauty on my screen. And yet here we are, moving forward; remembering. I am an emotional girl. I know that may sound cliché, but for reals, I cry at commercials. Like, a lot of them. And lately my emotions have just been swallowing me up. I was feeling a pull to focus and just put those emotions and all my love into praying when I sensed hurt. I gotta say, I got overwhelmed. My emotions got the best of me and putting those into prayer created an opportunity to continue to walk forward and be supportive when I could. I suppose sometimes I just wonder the world is coming to, I watch the news and I can barely handle the sadness, the stories of abandoned children and hungry families. People that are homeless and poor and sick. Sad and angry people taking guns into schools. Corruption in government, the devastation of war. Although I know as long as the world has gone round, these things have been happening. Probably due to our increased access of technology is what makes it seem like there is more awful now than ever. Either way, I refuse to be numb to it. Than there is the grief that is occurring in my own circles and in the lives of those I love. Death, cancer, sickness, infertility, affairs, divorces, abuse, brokenness, depression. People going through the unimaginable. I sometimes wonder why God gave me a heart of compassion. Because although I have this one compassionate heart I can’t always make the impact I desire. I am not swimming in a bunch of money, I don’t have clout in a high powered company, I am not a genius and I don’t often have the right words to bring comfort. All I have to give is me. Maybe a kind word, a little note or just an understanding nod across the aisles at the grocery store. Generally all I can do is fall on my knees and pray. Praying for guidance, praying for inspiration and for refueling. In that refueling we find His good. Our friends that pick us up when we are broken. Our families who love us no matter what we do. Giggles in a little boy that ran barefoot in the grass for the very first time. Flowers that come up year after year despite the terrifying cold that comes every winter. The smell of a new baby. Coffee with a dear friend. The softness of a brand new puppies fur. The pleasure in doing something that you enjoy. The little things and the big. Realizing that at the end of a really big storm you will see the sun again. You will. Then they cried to the Lord in their trouble and He delivered them from their distress. He made the storm be still, and the waves of the sea were hushed. Then they were glad that the waters were quiet, and He brought them to their desired haven.